Budapest is famous for its nightlife. Few, if any, Central or Eastern European cities match the bars and clubs of what’s known as both the Queen of the Danube and the Heart of Europe. And to see the true heart of Budapest, you have to go to the romkocsma, or ruin bars. Ruin bars are exactly what the name suggests: abandoned, derelict buildings that have been transformed into local watering holes. Concentrated primarily in the city’s Jewish Quarter in the seventh district, ruin bars vary widely in style and offerings but are the collective heart of Budapest’s inner city. 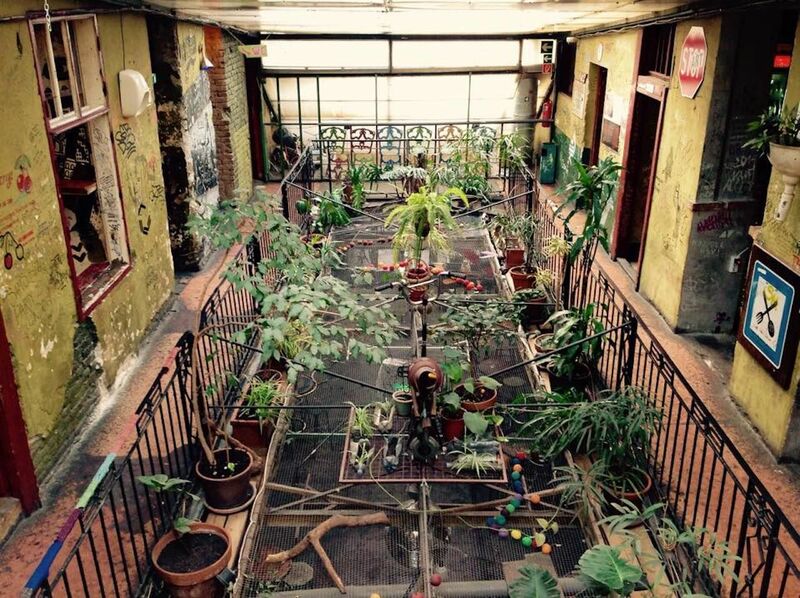 Most have an open-air courtyard, eclectic and mismatched furniture, and, in general, cheap beer and food. They’re also where you can find both locals and in-the-know tourists. But it wasn’t always this way. Ruin bars and the thriving nightlife scene in Budapest are relatively new, but their roots date back to WWII. Hungary fought alongside Nazi Germany and the Axis powers for much of the war. During that time, Budapest’s Jewish population was deported to death camps or forced into a district that had been converted into a ghetto. Germany turned on Hungary and occupied the country in 1944, just before the end of the war. Soviet Union occupation followed and lasted up to the dissolution of the USSR. During that time, many of the abandoned apartment buildings and warehouses in the seventh district crumbled into disrepair. In the early 2000s, a group of young entrepreneurs wanted a community space for hosting cheap parties and events. In 2004, the first ruin bar, Szimpla Kert, opened in a run-down building at 14 Kazinczy Street. Without money to invest in upgrading and furnishing the place, the owners and regular patrons brought in whatever bits and bobs they could, and the bar gradually took on the eccentric, mismatched appearance that it’s renowned for today. Others quickly followed. Investment in the Jewish Quarter grew with the popularity of ruin bars, and developers took advantage of the cheap buildings. Over the years, the trend spread to other districts, sometimes with bars only open for a few months. Ruin bars went from a gritty place to grab a beer to a commercial investment to the established institutions they are today. It’s not all about the party. In February 2018, a referendum was held for the residents of the Jewish Quarter regarding a rule that all bars and clubs close between midnight and 6:00 AM. With barely 15 percent of residents showing up to vote, the result was declared invalid, and therefore the rule was not implemented. This would have undoubtedly damaged the nightlife scene in the city and been the ruin of the ruin bars. It’s easy to understand where the residents who support the closing times are coming from. The party scene is pumping every night of the week, bringing noise pollution and unruly tourists. However, ruin bars are inextricably linked to the soul of the city, and most residents can’t image Budapest without them. Part of the reason is that ruin bars aren’t just about drinking. During the day, some of the spaces are converted into flea and farmers markets where you can shop for authentic Hungarian delicacies and support local producers. 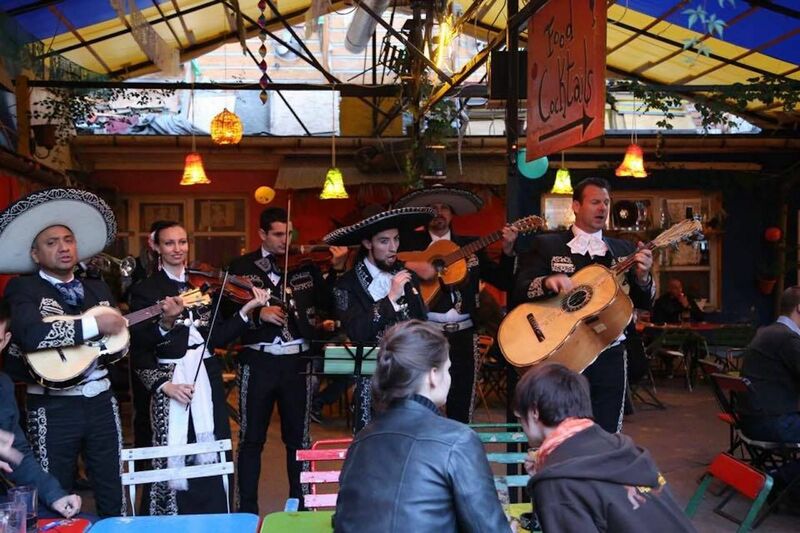 Two of the best include the Szimpla Kert farmers’ market (every Sunday from 9:00 AM to 2:00 PM) and Finom Placc at Ellátó Kert (every Wednesday from 5:00 PM to 9:00 PM). If you’re seeking a night out on the town, a cozy corner to listen to some live music, or a market filled with Hungarian specialties, then there’s a ruin bar for you. Szimpla Kert: The ruin bar that started it all has become a major tourist attraction. Opened in 2004, Szimpla Kert (which translates to “simple garden”) has its own souvenir shop. On any given night of the week, a line of people stretches out onto the sidewalk, waiting to get a glimpse of the bar. Once inside, you’ll see that it clearly lives up to the “garden” in its name. Szimpla Kert has a maze-like layout with a collection of interesting objects in every nook and cranny of the building. An old Trabant car, for example, and a room full of old computer screens. Tires and bathtubs are used as seating, and artwork covers every inch of the crumbling walls. Despite the international attention, it’s still a community center. 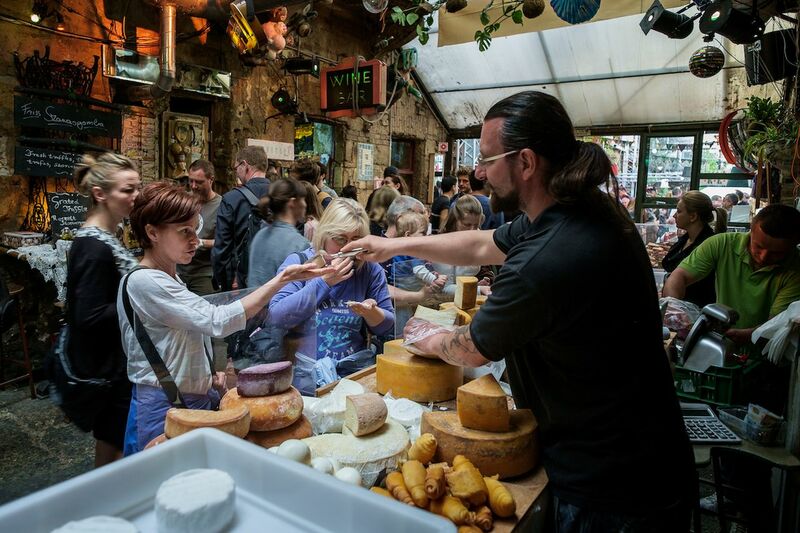 Events for both locals and travelers are held during the day, like the local-focused Hungarian farmers market where pastries, salami, cheese, preserves, and fresh produce is sold. Anker’t: Open only during the summer months, Anker’t is one of the largest outdoor beer gardens. It’s also one of the most hidden and is still more of a spot for locals. The focus here is on the culture. Anker’t hosts vegan markets, poetry slams, and art exhibits in addition to serving as a place to drink a cold beer. Ellátó Kert: Also located on Kazinczy Street is Ellátó Kert (“provider garden”). The bar is filled with Mexican decor and serves food like tacos and drinks like margaritas. There are also popular fröccs (spritzers) and grapefruit-vodka shots. It recently started hosting a small food market, Finom Placc, on Wednesday evenings. It is smaller than Szimpla, but no less delicious, and has a local vibe. Red Ruin Bar: For something a bit different, you can head just outside of the Jewish Quarter to the Red Ruin Bar. The walls of this small bar are filled with pop art mocking fallen communist regimes and leaders. Go for a local beer and plenty of the national fruit brandy, palinka.